Joe Simon has a typical New York apartment; that is one that in most areas of the country would be considered rather small. Despite that fact Joe has managed to accumulate an amazing amount of material. 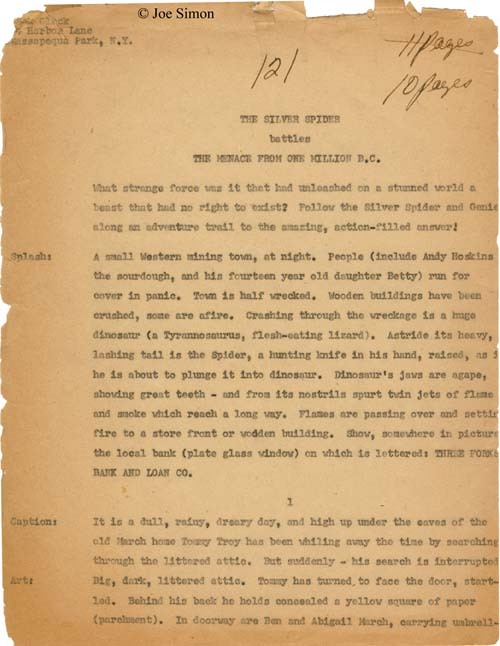 I am constantly surprised with what I find and the latest gem is a Silver Spider script “The Menace from One Million B.C.”. In 1953, a year before the devastating Senate investigation into comics, I was visited by C.C. Beck, the artist behind the success of Captain Marvel. Beck told me that he owned the Ukulele Bar & Grill in Miami, Florida, and while tending the bar, often thought about doing another superhero. He offered to “take a crack” at the business again, if I would come up with an idea for a new character and a script. Jack Oleck, my brother-in-law, who had been the number one scriptwriter for Simon and Kirby since the early days of Young Romance, had time on his hands. 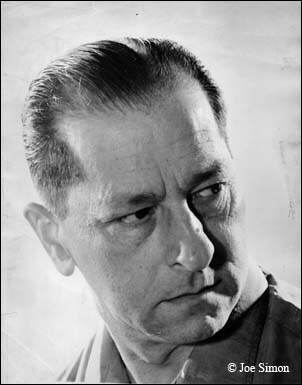 Oleck always had time, even if he turned out a script seven days a week. As always, he was anxious to join in a new venture. It was a good thing that I came across this script because as can be seen in the image of the first sheet the script is badly suffering from the affects of time. All pages are badly yellowed and quite fragile. The first page has suffered a bit but it was the last preserved page that has been damaged the most. The original last page of the script is no longer present; I cannot say if it was detached not too long after the script was written, got separate from the other pages and may yet be found in Joe’s collection, or has been completely crumbled and is now lost forever. With “The Menace from One Million B.C.” was yet another Jack Oleck script in similar condition. That script was for “His Brother’s Keeper” which was published by Atlas and therefore was not done for Simon and Kirby. I originally wrote about a xerox of the first page of the script (The Astonishing Jack Oleck) but now that I have the complete original version I may revisit the subject. As can be seen from the first page the actual comic story was first planned to be 11 pages long and then modified to down to 10 pages. I am uncertain what the 121 written at the top meant but a similar notation is found on the “His Brother’s Keeper” script. I wonder if it was a reference to the fee to charge for the script. If it was Jack would have been charging $11 a page (before the page count change). The preserved script appears to be a carbon copy. I am not sure if that explains Jack’s tendency to type slightly off the page but I am pretty sure it is why on one page the last line is almost entirely below the lower margin. Besides the notations at the top of the first page there are numerous corrections and modifications done in pen. The ink is brown in color but I understand that is a common transformation over time (if I remember correctly it is due to iron particles in the ink that literally rust with age). The modifications begin on page five of the intended comic and extend throughout the rest of the story. These modifications were made to change the story from 11 to 10 pages. Many of the changes are simple alteration of the panel numbering other changes are more extensive alterations of the script. The plot involves a search for a lost gold mine, gun tooting villains, and a flame breathing dinosaur. Needless to say it is a story with a lot of action. It is however a story for young readers very much along the lines of Captain Marvel. The device of a young boy transforming into an adult superhero is shared with Captain Marvel. Although C.C. Beck is closely associated with the big red cheese, Simon and Kirby had also produced an early Captain Marvel comic book. The genie, particularly as portrayed in the Silver Spider, is unlike anything used in Simon and Kirby productions. The 1953 date that Joe provides for the genesis of the Silver Spider makes sense since the use of machine guns and dynamite as weapons indicate that this script was written before the Comic Code after which such violence was strictly forbidden. One thing to notice is the complete absence of Jack Kirby in what Joe writes about the Silver Spider. This seems credible, because if Jack had been involved he would have done the art for the origin story as he did for all Simon and Kirby creations. But since this was a favor for C.C. Beck he would do the art (The End of Simon & Kirby, Chapter 10). Simon’s contribution seemed to be coming up with the idea with Beck, working on the logo, providing the contact with Oleck, and taking the package to Harvey Comics. In the end Harvey decided not to publish the new superhero. C.C. Beck’s art lingered in the Harvey storeroom until Joe retrieved it to provide the basis of the Fly for Archie Comics. Was the script for “The Menace from One Million B.C.” also retrieved or had it remained in Jack Oleck’s possession to go on to Joe along with the script for “His Brother’s Keeper” when Oleck passed away? In any case “The Menace from One Million B.C.” was probably too whimsical a story to be recycled into the Fly and so remained unused. Posted March 9, 2007 in 2007/03, Artists, Oleck, Jack, z Archive. From “The Comic Book Makers” by Joe Simon and Jim Simon we learn some information on Jack Oleck. We find that Jack was a writer frequently used by the Simon and Kirby studio. Also that he was Joe Simon’s brother-in-law. From Foxhole we also learn that Jack had been a Sergeant in the Army. Recently I have posted about two stories from Foxhole that were scripted by Jack Oleck (“Office Upstairs” in #3 and “Thirty Year Man” in #4). In terms of getting an idea of Oleck’s writings at that time this is not a lot to go. This would be all that we would have if it were not for copy of part of a script that Joe Simon has in his collection. The page has Jack’s address and the comic for which it was written. 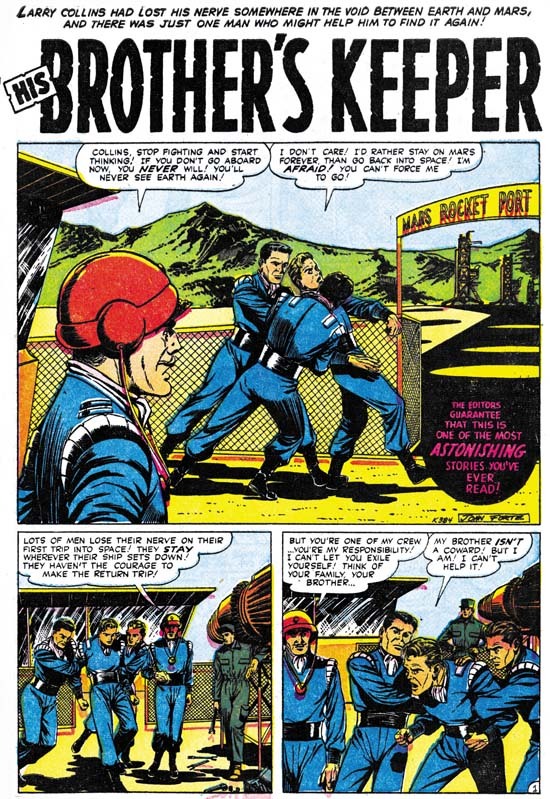 The story was “His Brother’s Keeper” and was published in Astonishing #55 (November 1956) by Atlas. We find Larry Collins on Mars as he resists returning to his spaceship for the return trip to Earth. This was his first space voyage and he has developed a fear of returning to space. He does not care that if he does not overcome his fear he will never return home. Larry runs away so the Captain enlists the help of Larry’s older brother who also happens to be on Mars. It is a fun four page story but despite the blurb on the splash page it is not one of the most astonishing story you will have ever read. The copy of the script only covers the first page and the very start of the second. The published version closely follows the original script. The only change is one small portions in the first panel which I have struck out. Actually I feel it was a good choice of editing since the excised portions was not really necessary. I have copied the original script below. A rocket port on Mars. Not necessary to show any rockets. A group of uniformed spacemen is dragging Larry Collins toward a gate leading onto field. Larry is also a spaceman in uniform, very young. Over gate is sign: MARS ROCKET PORT. This entrance for ship’s crew only. Looking on is a ship’s captain. I don’t care! I’d rather stay on Mars forever than go back in space! I’m afraid! You can’t force me to go! Men have dragged Larry through gate. Here a mechanic who is working on a rocket motor which has been set up on a stand turn. I can try! Lots of men lose their nerve on their first trip in space. They stay wherever their ship sets down. Forever! They haven’t the courage to made the return trip. Larry still struggles. Mechanic has stopped working, watches. My brother isn’t a coward! But I am! I can’t help it. Larry has started to fight even harder. As far I know, Jack Oleck’s work for Atlas Comics had not been noted by any comic book historian. He is not listed in the database at Atlas Tales which has a wealth of information. Of course it is difficult to know who the writers were during this period because credits were not normally provided. Oleck did this script after the break up of the Simon and Kirby studio and before the Atlas Implosion. Before the Implosion Atlas published about 85 titles (from Tom Lammers “Tales of the Implosion”). So it is not surprising that they employed some writers, probably on a freelance basis. After the Implosion Atlas could only 16 bimonthly comic book. Under those circumstances most, or perhaps all, of the writing could be handled by Stan Lee and his brother Larry Lieber alone. The services of many freelance scripters such as Jack Oleck was no longer needed. Jack Oleck also did writing for DC comics. When he started is not at all clear. A search of the Internet indicates that he was scripting for DC in the 70’s. It is likely he also wrote for them before that but since the comics did not provide credits during that period we cannot be sure.